Children at the new Baptist Mission in Zapotillo, Honduras. “You shall receive power . . . and you shall be My witnesses . . .
od answers prayer! 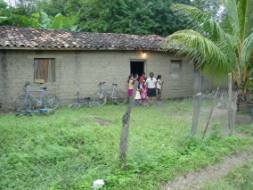 Ann and I have been praying three years for a pastor to start a new Baptist work in Zapotillo, Honduras. God answered their prayers by sending a Honduran Baptist pastor with over twenty years experience starting churches. October 27, 2005, we formally organized a Bible study group into a Baptist mission, and petitioned Alpha and Omega Baptist Church, Danli to be the mother church. 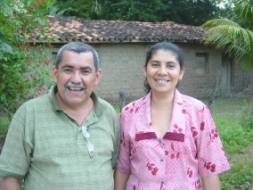 Saul Sabillon with his wife Edith Zulema is the pastor of the Baptist Mission in Zapotillo. Eighteen people attended the first home Bible study. 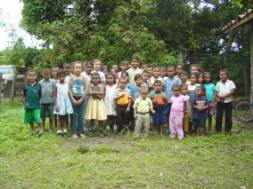 There are fifteen adult members of the mission, and over thirty children attend the children’s Bible classes. 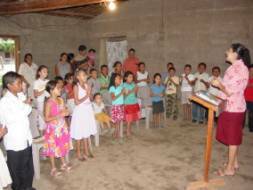 Zulema is teaching a group of children in the Baptist mission at Zapotillo. Wil taught a Pastor’s Leadership Training course on personal evangelism and discipleship to pastors and church leaders at the Alpha and Omega Baptist Church in Danli, October 2005. With the exception of pastors, the majority of the students had never shared Christ as a personal witness. The course began with a presentation of the Biblical basis of salvation. No one has ever been saved by false teachings. Each student was given a pocket New Testament in Spanish. Wil taught the students how to mark their Testaments so they could easily go from verse to verse along the Roman Road (John 3:16; Romans 3:23; 6:23; 5:6, 8; 10:9-10; 8:1; 5:1-2). Mud block house where Baptist meets. After a discussion of the meaning of these verses Wil and a student role-played how to use their New Testaments and share the plan of salvation as a personal witness. Then the students divided up in groups of three and “witnessed” to each other. These practice sessions gave the class confidence with peers before going out into the community. When the class returned after the first visits four people had placed their trust in Christ as their Savior. They studied additional Scriptures, false “gospels,” sects, etc. before going out again. During the week the class went out witnessing seven times and 55 people placed their faith in Christ. Wil is preparing a similar one-day witnessing workshop for pastors and churches. 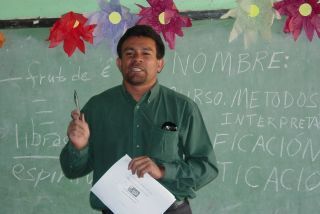 q Pastor and Church Leadership Training Ministry in Honduras. To reduce costs we will not build buildings, but operate out of existing churches or church assembly grounds.